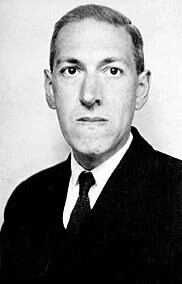 Happy Anniversary of Howard Phillips Lovecraft's Death! Morbid, I know, but I really feel the now-esteemed writer of cosmic horror would enjoy us celebrating his eventual demise as much as his birth. So much of his work centers on the end of his protagonists, straight jacketed or daisy-pushing. 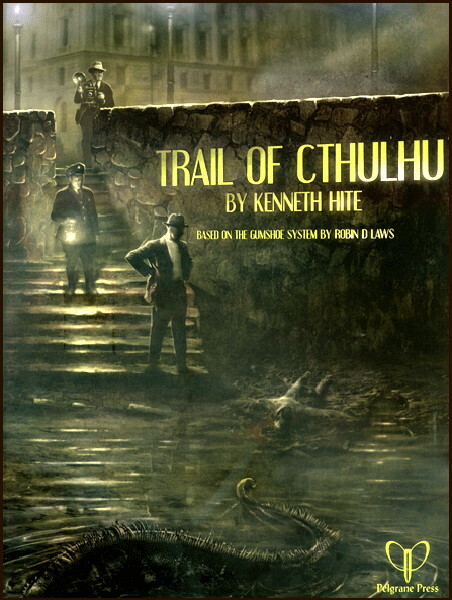 To that end I shall spend the day by reviewing Trail of Cthulhu, a role-playing game which pays loving homage to the horror writer's works and the body of Mythos fiction which he inspired. 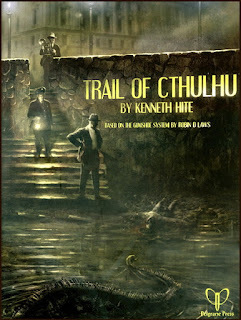 Trail of Cthulhu was written by Kenneth Hite, a devotee of H.P.L. in his own right, and published by Pelgrane Press. The book has been around since 2008, and has been faithfully and consistently supported by a slew of adventures, campaign frameworks, and supplements. Trail of Cthulhu does not pretend that it has no relation to Call of Cthulhu. The opposite actually, it seeks to update the classic for a slightly different audience, to the point that Chaosium, the original publisher, has officially licensed it. The core of the game is based around the Robin Laws' Gumshoe system. The main tenet of this system is that no piece of information needed to solve the mystery should be missed. The failing of most investigative games is that a die-roll can bring the whole endeavor to a screeching halt. To do this, it splits the things that characters do into two categories, General Abilities and Investigative Abilities. General covers all the things that are the usual RPG fare, running, fighting, shooting, stealthing, first aid, etc. Investigative covers all the things you use to find out critical clues to a mystery, Evidence Collection, Chemistry, Cop talk, etc. You roll general abilities and there is a chance of failure. Investigative abilities, however, give you the minimum information you need automatically. You can get more out of both by making Spends. Each ability has a pool of points, which refresh periodically, that allow you to improve your results. Character creation is carefully balanced to ensure that all the bases are covered for investigation, giving the GM complete freedom to create adventures with any kind of clue that Abilities can cover. Some of you may now be saying something like, "Well if I always succeed, what's the fun in that?" I hear you, and this is the pitfall a lot of people fall into when they are trying to learn GUMSHOE. It's just a shift in perspective. The game isn't about succeeding on your rolls to find clues, its about interpreting the clues you receive. In this way it perfectly emulates procedural investigative drama, able to emulate favorite flavors like Law & Order, CSI, and even Star Trek. It's an excellent fit for Lovecraft's Cthulhu Mythos. Trail of Cthulhu adds to GUMSHOE several elements which capture everything we loved about Call of Cthulhu's flavor with more modern RPG sensibilities. Hallmarks of the original Call of Cthulhu include occupations, Slipping sanity, and players in near-constant peril from the forces they fight against. Trail of Cthulhu takes occupations and uses them to shape what skills come easier to an investigator and give them special abilities only they can access. Sanity is broken into stability and sanity. Stability in Trail is the buffer for all sorts of mental trauma, while Sanity is the purview of the truly traumatic and other-worldly. Stability has sources and Sanity has pillars, which act as context for why a character would soldier on against impossible odds. Combat in Trail also captures all of the deadliness of Call of Cthulhu as well, though spends on general abilities allow for a lot of dodging horrible peril by just a hair's breadth. OK, but we didn't all play Call of Cthulhu the same sanity-blasting way, and Trail allows us to set the tone. Optional rules allow for a more two-gun toting pulp feel or for a more helpless purist feel. These kind of cool GM tools extend into the Mythos creatures. There are stat blocks, sure, but the exact nature of the horrible things from beyond our world are given a lot of space for creative re-molding. Extensive GM advice is also provided on how to structure and create your own adventures, along with a sample investigation. Last but not least, in a wonderful bow to what has come previous, extensive rules for converting old Call of Cthulhu adventures. 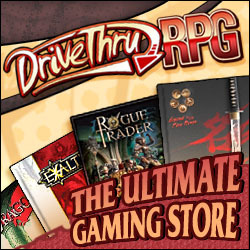 This is also thoroughly supplemented with conversion rules made by the authors and fans, which are all very high quality (http://www.pelgranepress.com/site/?tag=download&cat=10). Trail of Cthulhu overall provides a very complete gaming system that has a well thought-out structure and encourages investigative play by closely following the spirit of the genre. It may be a bit revolutionary for some gamers and Call of Cthulhu loyalists, but it gives a whole new way to experience the Lovecraft's Mythos. Pitch-perfect emulation of procedural investigation which fits the Mythos so well. Customizable enough that you can turn the pulp dial all the way down to The Colour out of Space or all the way up to the Shadow over Innsmouth (except give the narrator a Tommy-gun). You can play nearly any of the well-loved Call of Cthulhu classics from your dusty collection, with minimal player and wallet pain. There's a learning curve to understand what the game and system are about, which paradoxically will be harder for those who have played a lot of table-top previously. I think games of Trail will have a hard time handling a lot of player absence, an unfortunate reality in gaming. There are solutions for this, but out of the box this might cause a campaign to lurch. The play-style of this game, like its predecessor CoC, isn't for everyone. For Trail of Cthulhu, being even less conventional, this is particularly true. A dyed in the wool D&D power-gamer will flounder here. Love the review. Hope you don't mind but I posted a link to it on my blog. Not at all, please repost to your heart's content and the word will get around :).